Yep, that’s what I said. 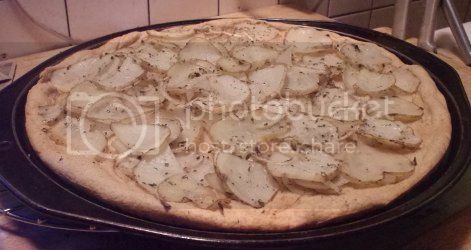 I love potatoes, I love pizza, and I love Twitter for turning up this amazing, unique recipe from The Veagn Swedes’s blog. This is the perfect pizza for anyone who can’t live without seasoned, roasted potatoes. Because potatoes are the star of this pizza! 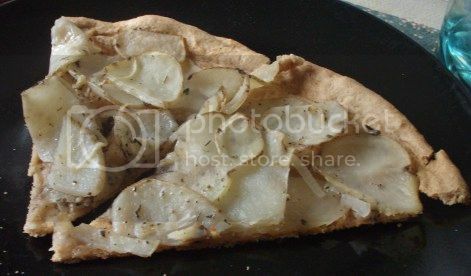 The only toppings are a little garlic and some spices mixed with olive oil, thinly sliced onion, and lots and lots of potatoes. Like, I used 3/4lb. of potatoes on one pizza kind of a lot. No denying it, man. First roll of the pizza cutter and I was in love. The crust is made with baking powder, so it’s super-thin and flaky, not puffy like yeast-based dough. That makes it very delicate both in texture and flavor, so it doesn’t overwhelm the toppings. Because you don’t want to overwhelm a roasted potato. I’m seriously tempted to make the full recipe (which turns out 2 pizzas), cut them up small for appetizers, and bring them to the next church luncheon. I’ve no doubt it would disappear in a heartbeat. This is another case of simple food being awesome food. 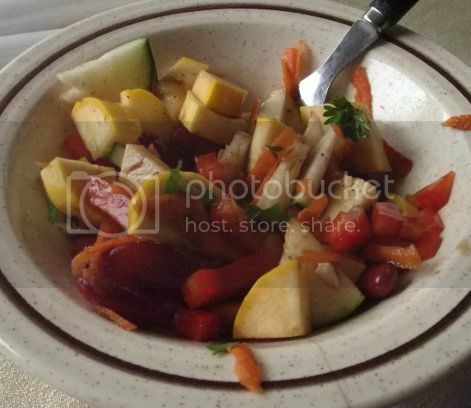 Simple and tasty main dishes need simple and tasty sides so, while the pizza was cooking, I got out a bowl and threw some veggies at it until I had a salad. If you don’t have parsley on hand, any fresh herbs with a light flavor will do. 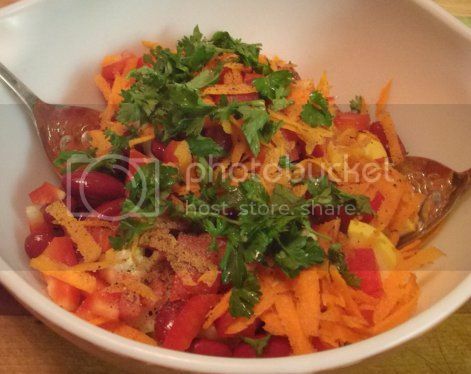 1) Combine all ingredients in a medium bowl and toss to combine. 2) Serve with balsamic vinegar and let everyone add their own!